We offer comprehensive dental care. The information belows is a partial list of services that may be of interest to you. On your first visit we will conduct a comprehensive examination and a periodontal evaluation. Necessary x-rays will be taken in order to fully examine your oral cavity. After gathering all of the necessary information, your treatment options will be reviewed with you and a personalized plan will be developed. Digital radiographs are a focused beam of x-ray particles passed through bone which produce an image on special film, showing the structure through which it passed. This provides the familiar black and white images doctors and dentists use to diagnose problems and disease. Without an x-ray of the whole tooth and supporting bone and gum tissues, there would be no way to detect infection or pathology that requires attention. In our office we use digital radiography which allows us to take x-rays using up to 90% less radiation than conventional film x-rays. With this technology, we are able to take an x-ray of your mouth by using a small sensor which records the image of your teeth and sends it to a computer. The result is a highly detailed image of your mouth that can easily be enhanced to better diagnose dental concerns and determine the very best treatment for each case. We use small intraoral cameras about the size of a pen to clearly see the condition of your teeth and gums. With this advanced technology we can zoom in on small diseased areas, cracks, chips and worn metal fillings with extreme precision. The full-color images taken with the intraoral camera are sent to a computer screen so we can clearly see and diagnose dental problems much earlier than with traditional dental technology. Because images are displayed on our screens, patients will be able to see areas being worked on and are also able to gain a better understanding of dental procedures being performed. A dental cleaning is a professional service you receive from a dentist or dental hygienist. Most dental cleanings take approximately 25 to 30 minutes. Cleanings should be performed every six months to prevent excessive plaque buildup. Plaque left untreated can lead to unhealthy gums and tooth decay. A routine dental cleaning should include scaling, root planning and polishing. Scaling is the process of removing plaque and tartar deposits from all tooth surfaces. Different methods are used depending on the amount and type of deposits. Traditionally, scaling is perform by hand. However, we have available new and advanced technology that allows us to use more modern methods such as electronic scalers. This sophisticated tool allows dental cleanings to be performed more efficiently and in a timely manner. To achieve best results, both electronic and manual scaling methods are combined for dental cleanings. Polishing is the last step in tooth cleaning and involves finishing the surface of the teeth to make them shiny and clean. There are two kinds of polishing: air polishing and rubber tip polishing. Air polishing works by spraying high pressured water mixed with baking soda paste onto the surface of your teeth. This powered water washes away residue and plaque while baking soda removes stains. Rubber cup polishing uses a low-speed and gentle handpiece that contains a polishing paste made of abrasive ingredients ideal for removing stains. The gums, ligaments, and bone around the teeth form the foundation for one's teeth. All structures are also referred to as the periodontium. When the periodontium is not healthy, it jeopardizes the teeth just as a bad foundation would threaten the stability of a house. Signs of unhealthy periodontium (gum disease) may be as follows: gums that are red and bleed easily, persistent bad breath, gums that are pulled away from the tooth, loose teeth, and changes in the position or bite of the teeth. Any of these signs may mean something is wrong. With the proper care, however, it may be possible to return them to a healthy state. This is where appropriate gum treatments come in. If you are having a problem, come in and see us so we can take care of it right away. The treatment usually involves a deep cleaning or root planing done under a local anesthetic, along with local antibiotic agents. If the gum disease gets too severe it may need to be treated through surgery or extraction. This is why it is important to get it treated at the first sign of a problem. We recommend pit and fissure sealants as a great procedure for the prevention of cavities in back teeth. They are used to fill in narrow grooves in teeth that cannot be adequately cleaned by brushing. In some cases, the tooth structure has fine grooves or pits which accumulate plaque, not because the person does not brush, but because they are too narrow to allow even one bristle into them. These will develop cavities over time. So we will brush on a coating that seals the grooves and pits, making it possible to brush off all the plaque and keep your teeth healthy. Orthodontics is the art of using appliances to move teeth so that they end up straight and aligned. Most commonly, it involves the use of braces to move teeth into their proper position. In this method, brackets are bonded to the teeth and arch wires are threaded through the brackets. The arch wires act as a track and guide each tooth to its proper position. We can offer several types of orthodontic braces, including the more traditional metal braces, ceramic "tooth-colored" braces, clear plastic braces, as well as the Invisalign System (see below). Ceramic braces are translucent brackets that blend in with your natural tooth color. They are used with patients who are concerned about the appearance of their smile as they are less metallic-looking than traditional braces. Clear Braces utilize brackets made of monocrystalline sapphire, which make the braces nearly see-through except for the thin arch wire. Next to the Invisalign System (see below), clear braces are the closest thing to invisible braces. Metal Braces are the most economical and traditionally used braces. Metal braces are also ideal for those with more extensive realignment needed. We will advise you if metal braces are required for your treatment. The Invisalign treatment consists of a series of clear, snap-on, custom fit, removable mouth trays or aligners that apply a controlled amount of force to your teeth forcing them to shift. The system provides the same beautiful results as traditional braces, but since the trays are made of clear plastic, they are virtually invisible. In addition, because Invisalign trays are removable, they can be taken out while eating, drinking, brushing and flossing. The Invisalign System works by first creating a series of trays that will each move your teeth gradually until the end result is achieved. At the end of each two-week period, you will switch trays. Throughout the process, you will visit us every four weeks to ensure treatment is progressing as planned. Once your treatment is complete, you will likely wear a clear retainer to ensure your new smile stays in place. Root canal treatment (also referred to as root canal therapy or endodontic therapy) is made necessary when a cavity is allowed, through neglect, to reach all the way to the inner tissue, known as pulp or nerve. Sometimes, deep fillings or trauma to a tooth may cause the nerve to be damaged to the point that it needs root canal therapy. Once this occurs, the pulp becomes infected and can extend through the root tip and begin to eat away at the surrounding bone (this is known as an abscess). By the time the pulp is infected, it must be treated because it cannot heal on its own; it can even weaken the entire immune system. This is dangerous, not to mention very painful. Symptoms that the pulp has become infected may include sensitivity to hot/cold or sweets, swelling, pain to biting or pressure, and a bad taste in the mouth. Sometimes, if the infection is chronic or not active, no symptoms are apparent and the person is unaware of any problem until a checkup. A root canal is then performed to clean out the infected tooth pulp and disinfect the canals of the tooth. The only other treatment option would be to extract the tooth. Once the infection is resolved, the canal (or canals, since there may be more than one) is filled in to prevent any further infection. Usually, a core build-up and crown are recommended for restoring a tooth that has had root canal therapy. Composite (plastic) resins are custom made to the exact color of your natural teeth, creating a more natural appearance. These fillings may be less noticeable than other materials. They may not be ideal for large fillings as they may chip or wear over time. They can also become stained from coffee, tea or tobacco. If decay or a fracture has damaged a large portion of the tooth, a crown or cap may be recommended. Decay that has reached the nerve may be treated through root canal therapy or through a procedure called pulp capping. Our office offers a wide array of cosmetic options. Some of these options are orthodontics, whitening, smile design, re-contouring of the shape of the teeth, veneers, bonding, and all ceramic/porcelain crowns. A dental restoration is a material that has been placed in a prepared tooth to restore function and morphology when tooth structure has been lost due to: 1) decay or fracture (generally because of extensive caries which weaken the cusps or external trauma), or 2) to improve the aesthetics of the tooth. Dental restorations may be fabricated out of a variety of materials and come in two broad categories: direct and indirect. Direct restorations are created inside the mouth, while indirect restorations are created outside of the mouth and require preparation in a laboratory. While it is being prepared, a provisory restoration must be placed in the cavity in order to maintain the occlusal space and the contact points, in addition to promoting and keeping the periodontal and pulpal tissues free of harm. Tooth whitening is a popular procedure to make teeth whiter and brighter and, therefore, more attractive. Bleaching can be used to whitened stained and discolored teeth, or simply to enhance a dull smile. Either way, tooth whitening is a safe and relatively painless procedure ideal for most patients. In-office whitening is an ideal procedure for anyone wanting immediate results. Because the entire procedure takes place in our office in about an hour, it is the perfect choice for busy individuals. In this process, a protective gel is applied to your gums to protect the soft tissue. A second gel is then applied to your teeth and the whitening process takes approximately one hour. Finally, we take impressions of your teeth to create custom trays for at home touch-up and give you instructions for keeping your smile bright. The result is dramatically whiter teeth that will last for years. Veneers are a dental procedure in which a covering is placed over the outside (visible area) of the tooth. Veneers are usually limited to the part of the teeth that is visible when talking or smiling. The procedure can be direct or indirect. The direct technique usually involves placing composite resin on the outside of the tooth using bonding. This method is sometimes referred to as bonding. The indirect technique usually involves two appointments because the veneers will be fabricated at a dental laboratory. At the first appointment, the teeth are prepared, impressions are taken, and the teeth are given a temporary covering. In two to three weeks the veneers are back from the laboratory, the temporaries are removed, and the veneers are bonded to the teeth. The laboratory fabricated veneers are usually made using porcelain or pressed ceramic and are very aesthetic. Crowns are full-coverage restorations that are used to cover a tooth that is likely to break or is too broken down to be restored with a filling. The materials used may be cast gold alloys, non-precious metal alloys, porcelain bonded to metal or zirconium base, or all ceramic. They are most commonly done after root canal treatment or when a large filling wears out. 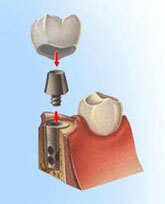 The larger the hole made by a cavity that has to be treated, the more likely a crown will be needed. Even after a filling is put in a large cavity, the tooth is more likely to break. Keep in mind that the jaw muscles are the strongest in the human body. Teeth are subjected to tremendous pressures. Crowns ride over the weakened tooth providing strength and protecting the tooth against breakage. A broken or cracked tooth is a far more serious matter and much more difficult to treat. Crowns prevent this as well as making for a nice smile. It takes two appointments to restore a tooth with a crown. In the first, any decay is removed from the tooth and it is shaped to accept the crown. Then an impression is made of the tooth for use in fabricating a crown. Between the two visits, the crown is made usually of high-strength porcelain over gold alloy, all ceramic material, or gold. During this time, a temporary crown is worn. In the second visit this temporary is removed. Then the permanent crown is adjusted as needed and then cemented in place. A bridge is an ideal method to fill the space created by missing teeth. A bridge is one or more artificial teeth that are cemented into place using the teeth on either side for support, hence the name. A bridge replaces the missing tooth, both functionally and cosmetically. Bridge work is as much an art as it is an exact science. The materials used may be gold alloys, porcelain bonded to metal alloy, or ceramic material bonded to zirconium base. The last three are made to match your natural tooth color. The choice of material depends on requirements for strength, wear, and/or aesthetics. It is important that a missing tooth be replaced as soon as possible for several reasons. If not treated, the teeth surrounding the gap will begin to shift inward. Since teeth use their neighbors for support, if one is missing they begin to "fall” and shift into the open spaces. This may worsen the bite due to changes in pressure and can eventually result in problems with the jaw such as TMJ. We work closely with an implant specialist who places the implant, and we restore it. A dental implant is an option to replace a missing tooth. In this procedure, a small titanium shaft is surgically implanted into the bone and allowed to set. The bone grows around it forming a tight connection, which additionally slows or stops the bone loss that occurs when the root of a natural tooth is missing. Once the implant is firmly set in the mouth, we attach the replacement tooth onto the top of the shaft. This permanent solution has the advantages over bridge work in that it does not stress the surrounding teeth for support and, should the tooth wear out, another one can simply be replaced on the shaft. Implants can also be used as support for an implant bridge. This is an alternative to partial dentures and has several advantages. First, there is no adjustment period to acclimatize. Once the work is done, the patient only feels teeth, not metal supports. Second, this slows the bone loss caused by missing teeth. Third, there is no discomfort or difficulty in eating. And, best of all, they do not have to be taken out all. We also offer mini dental implants. These implants are about half the diameter of traditional implants and are used mainly to stabilize lower dentures. These implants can be placed in one appointment and be immediately used. The cost is less than standard dental implants. Although there are different types of dentures, they all share a common function: they replace teeth that have become loose or have been lost due to bone loss. When bone loss around the roots of teeth is great enough to loosen them or let them fall out, it's time for dentures. A removable partial denture is a device used when one or more natural teeth still remain in the upper or lower jaw. They usually consist of a metal framework and replacement teeth attached to a gum-colored plastic base. TMJ stands for temporo-mandibular disorder. Temporal, as in temple area of skull; mandibular, as in mandible or lower jaw; joint, is where the head and jaw meet. Problems in this joint may be caused by a malalignment of the teeth, trauma, or excess muscle tension. Aside from the two bones that meet there, cartilage buffers them and five muscles are involved in the area. If something goes wrong, a good deal of trouble can result. Dental treatments for the condition can include replacing missing teeth, moving teeth, adjusting the bite, filling gaps between teeth, etc. There is no one solution that is right for all cases. Often times an occlusal biteguard is used to prevent clenching or grinding that is contributing to the problem. If untreated and taken to extremes, surgery may be required to repair a badly damaged joint. If we have decided a guard is right for you, the dentist will take an impression of your teeth which will then be sent to a lab to make a custom fit guard for you. In most cases, you can choose from a variety of colors and styles for your guard. On average, guards last between 3 to 10 years.